There’s more fun coming our way on the 3D printing news front, as The Netherlands-based tech company FabLab Amersfoort has developed a new device that serves as a sketching tool for creating a 3D-printed object out of a simple 2D doodle. Called Doodle3D, the sketching tool provides users with both an app for creating 2D-based artwork and a WiFi receiver that can be connected to a 3D printer to instantly transmit finished drawings for wireless printing on the fly. In spite of 3D printing technology becoming more available, folks wanting to test the rapid manufacturing tech are limited by their ability to handle highly complex 3D design programs. The Doodle3D software does away with that by providing users with a simple and intuitive program to create line drawings on an iDevice or computer. Then, by simply pressing the print button, a 3D-extruded version of the 2D sketch is sculpted by your 3D printer of choice. The great thing about using such simple software for 3D printing is that it can make creating complex designs even easier. The software allows users to rotate their initial 2D sketch and add volume to their drawings by adding more layers that can be twisted and scaled. To make things even simpler, Rick Comapnje, inventor of Doodle3D, pioneered the creation of an accompanying WiFi dongle that is used as an intermediate transmitter between the iPad/iPhone/laptop and a 3D printer. 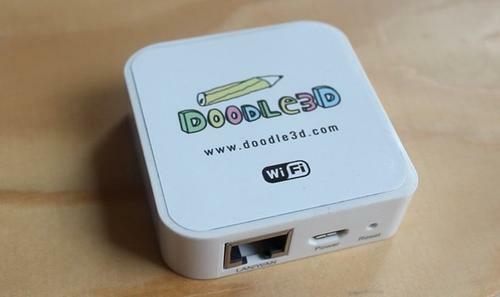 Users access the Doodle3D software by connecting to the WiFi box via their Internet browser of choice and can then save or print their doodle by hooking the box up to a printer by way of USB. Currently, the box only supports printers that accept 5D G-CODE over USB ports, but plans are in place to support commercial 3D printers as long as their formats are open-source enough to accommodate. The team is hoping to land at least $50,000 in support through its Kickstarter campaign. They’ve been honest about still having some kinks to work out before their program is ready for a full release. Nonetheless, the Doodle3D is a promising tool that has the potential of enabling the most novice of designers to create amazing works of art or useful household gadgets.